Speaking in far away United States of America, President Muhammadu Buhari on Thursday, explained why he would not hurriedly assent to the 2016 passed by the National Assembly. 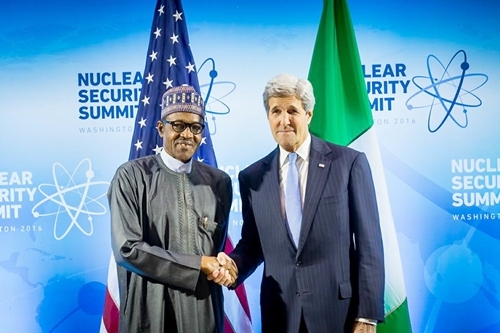 President Buhari holds bilateral talks with the United States’ Secretary of States. Speaking at a meeting with the United States Secretary of State, John Kerry, in Washington DC, President Muhammadu Buhari on Thursday, explained why he would not hurriedly assent to the 2016 National Budget passed by the National Assembly, adding that he would critically review the document before assenting to it. According to a statement by Femi Adesina, the Special Adviser to the President on Media and pPublicity, in view of the controversial alteration and padding of the budget proposals, the president needed to review the appropriation bill to be certain that its contents tallied with the authentic budget proposal presented to the National Assembly. While declaring that his administration will continue to vigorously prosecute its war against corruption, President Buhari sought and received an assurance from Kerry that the United States Government will facilitate the repatriation of all stolen Nigerian funds found within the American banking system. “It will greatly help our country if you assist us to recover all our stolen funds which we can establish to be within your financial system,” the president told Kerry. Responding, the Secretary of State said that he has been told that the stolen Nigerian funds were in ‘billions of dollars’. “It’s not easy to hide that amount of money and we are pretty good in tracing them,” Kerry assured President Buhari, adding that relevant United States Government Officials will meet with the Chairman of Nigeria’s Economic and Financial Crimes Commission to discuss further cooperation in that regards. Next UPDATE- WHY WE DIDN’T SEND DETAILS OF THE BUDGET,TO PRESIDENT BUHARI- NASS….